My 20-year old lighted plant shelf is ready for retirement. The fluorescent ballasts need replacing again, but this time around it’s not worth the cost. Instead I’m opting to update and downsize, which launched me into the confusing new world of plant grow lights in their many incarnations. It’s a befuddling market for home gardeners, because the biggest demand for indoor plant lighting comes not from us, but from the cannabis industry, followed closely by hydroponics and climate-controlled agriculture. In these cases, full sun plants like cannabis, lettuce, basil or tomatoes are grown to full maturity, which requires huge amounts of light. Gardeners use lights mostly to grow stocky seedlings of special varieties, an honorable goal that calls for careful study. Here are the three big questions to consider. 1. Where will you use your plant grow lights? Do looks count? I love to witness the miracle of germination up close, so I grow my seedlings in the main room of the house, which is kept comfortably warm. The supplemental lights brighten bleak winter days, and I’m more likely to spot problems early when young seedlings are close at hand. A well-chosen plant grow light can become a cheery asset to a room that will last for decades. On the other hand, you might grow your seedlings in a basement or other utility space, where appearances are much less important. 2. How many seedlings do you plan to grow? Starting small is always a good idea, because few people get seed-starting right the first time around. My first plant grow light was a single fluorescent tube light with reflective hood and adjustable legs that stood on a table or bookshelf, and it was great. Comparable current models include the Jump Start ($75, compact fluorescent) or the Sunblaster ($125, LED lights). Either will do a smashing job of providing light for veggie seedlings. 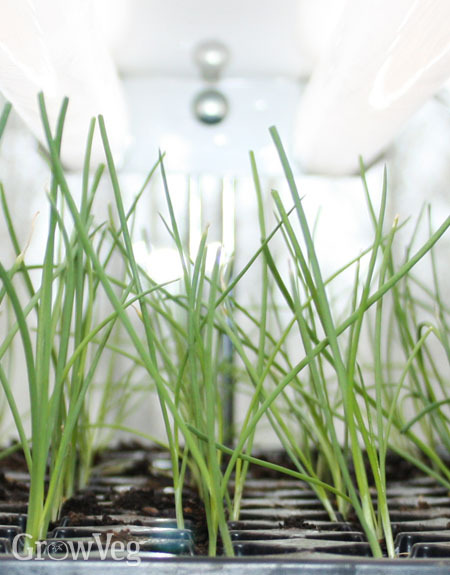 More seedlings mean more light fixtures, which can come with their own shelves and mounting hardware, or can be attached to inexpensive metal shelving units or utility carts. Most plant grow lights have holes in the reflective hoods so they can be suspended with lightweight wire or chain, but they may or may not have handy off/on switches. Check these details carefully if you plan to invest in numerous fixtures or a multi-shelf plant grow light. 3. What kind of lights do you need? Plant grow lights may use traditional fluorescent bulbs, compact fluorescent lights (CFLs) or light-emitting diodes (LEDs). LED plant lights use less energy and emit less heat than compact fluorescent lights, reducing costs and simplifying temperature control in enclosed environments. Go with full-spectrum LEDs (which don’t look purple) for growing seedlings, propagating plants, and perking up houseplants in winter. As for the zillion LEDs in blue, red, or other focused colors, reportedly cannabis is best grown indoors with LED lighting in which wavelengths can be fine-tuned to encourage vegetative or reproductive growth. Hydroponic and greenhouse growers like being able to replace their energy-hungry high intensity lights in part with energy-efficient LEDs. There is no doubt that future endeavours in climate-controlled agriculture will absolutely rely on LEDs. Because of their low heat emissions, popular home hydroponic systems including Aerogarden use LEDs, as do small “grow closets” marketed for growing herbs. On the down side, high-quality LED plant grow lights are costly, and you get what you pay for. Better quality LEDs use sophisticated diffuser technologies to help them mimic the sun. 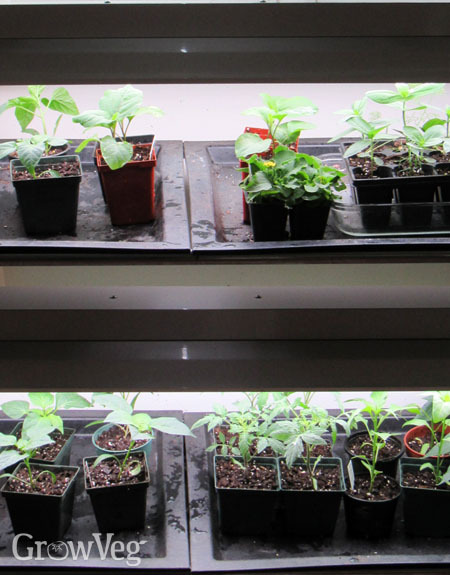 But do you need LED plant lights to grow pepper seedlings for your garden? Probably not. My old T-12 fluorescent lights worked great until they didn’t, so I can’t fault them for performance. Today’s T5 compact fluorescents put out almost twice as much light, so one bulb can do the work of two. I also like the small amount of heat emitted by fluorescent lights, which I put to use as bottom heat for germinating seeds. Drip-proof seed trays are needed, but a flat-topped fluorescent fixture can double as a heating mat that warms the planted seeds whenever the lights are on. As for the energy question, a home-size plant grow light setup using either LED or CFL bulbs will use so little energy that it will be a tiny blip on your electric bill. But the payback can be huge! With a good plant grow light, you can grow exactly the seedlings you want for your one-of-a-kind garden.